What started as a bounce for Democrats when Republican Rep. Mark Foley’s troubles surfaced late last month has turned into a sustained rally in electronic trading markets. Trading activity in both the Iowa Electronics Market , an online marketplace operated for research purposes where wagering is limited to $500 per person, and on the Irish-betting site Intrade suggest the odds of Democrats retaking control of the House in November’s midterm elections have steadily improved over the last two weeks. IEM trading at the end of last week put a 67% probability on that scenario, up from 50% earlier this month. Similarly, the political junkies betting on Intrade last weekend foresaw a 69% probability of a Democratic takeover of the House, up from 41% a couple weeks ago. Their view mirrors but is a bit behind the conventional wisdom. While many political analysts now see the chances for Democrats to control the Senate at around 50:50, the investors still believe the Republicans will retain control, with the confidence of some investors falling. As its technology companies soar to the outsourcing skies, India is bumping up against an improbable challenge. In a country once regarded as a bottomless well of low-cost, ready-to-work, English-speaking engineers, a shortage looms. India still produces plenty of engineers, nearly 400,000 a year at last count. But their competence has become the issue. A study commissioned by a trade group, the National Association of Software and Service Companies, or Nasscom, found only one in four engineering graduates to be employable. The rest were deficient in the required technical skills, fluency in English or ability to work in a team or deliver basic oral presentations. I’ll still expect to wind up speaking to India next time I have to call Dell tech support. Skeptico notes that “Deepak Chopra has an endless supply of meaningless drivel to churn out when anyone gives him a forum.” After totally humiliating himself last year when he gave a new age spin to creationist objections to evolution I thought he might have given up posting such anti-scientific nonsense. It appears there is just too much meaningless drivel in his head to be contained any longer. Chopra is a doctor, supposedly, but every time I read something by him that touches on biology, he sounds as ignorant as your average creationist. He also writes incredibly poorly, bumbling his way forward with a succession of unlikely and indefensible claims. This latest article is one in which I think he’s trying to criticize the very idea of genes, but it’s more like he’s criticizing his own lack of knowledge. Some people are just too dumb to quit when they are behind. Chopra is back with The Trouble With Genes, Part II. Respectful Insolence does a find job of responding to this one. What the creationist marketers are doing is attempting to brand themselves as scientists (who never do science) and to brand scientists as dogmatists (who seldom do marketing). When I use the word “creationists” with regard to the Discovery Institute, for example, I am attempting to brand them with a name I find more in keeping with my view of their positions. I do it consciously and with full knowledge that they would prefer that none of us use that word with regard to them. Creationist is a good term for these people, but if we are to look at this from a marketing perspective we must also keep in mind the fact that the average person likes short, snappy terms. In that spirit, I suggest rather than creationist we just shorten it to cretin. Short, snappy, and accurate. Created by Linden Lab in San Francisco, Second Life is the closest thing to a parallel universe existing on the Internet. Akin to the original city-building game SimCity, Second Life is a virtual, three-dimensional world where users create and dress up characters, buy property and interact with other players. More than 900,000 users have signed up to build homes, form neighborhoods and live out alternative versions of their lives in the 3D, computer-generated world. Players spend around US$350,000 a day on average, or a rate of $130 million a year. Usage is growing in rapid double-digit terms each month. 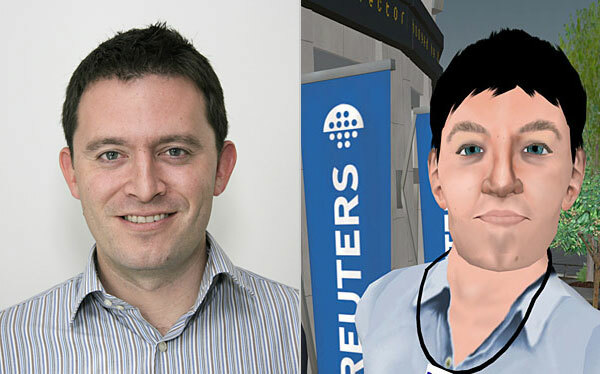 Mr. Pasick’s avatar, Adam Reuters, was modeled after the reporter, and sports a press pass so others know he buys his pixels by the barrel. He will set up shop in a virtual building made to look like a hybrid of Reuters’ London and Times Square buildings. While players who drop in (flying is one of only a few superhuman aspects of Second Life) can access Reuters news from the real world, the articles Mr. Pasick files will be strictly about — and addressed to — Second World players. One of his first examines Second Life’s biggest lender, who charges 40 percent annual interest. His dispatches will be posted at secondlife.reuters.com. Perhaps Fox News could create a virtual world to match their reporting. In their virtual world they could program in WMD in Iraq and there really would be an intelligent designer. As an example of the non-real world the right wing lives in, check out the report on this story at Ed Driscoll.com. They use the recent episode in which a free lancer for Reuters altered photographs. As Reuters fired the free lancer, this hardly provides evidence of their fantasy that the mainstream media is conspiring to distort the news whenever they don’t report in the manner of the Fox News virtual fantasy world. But the United States Coast Guard has a new mission for the waters off of these quiet shores. For the first time, Coast Guard officials want to mount machine guns routinely on their cutters and small boats here and around all five of the Great Lakes as part of a program addressing the threats of terrorism after Sept. 11. 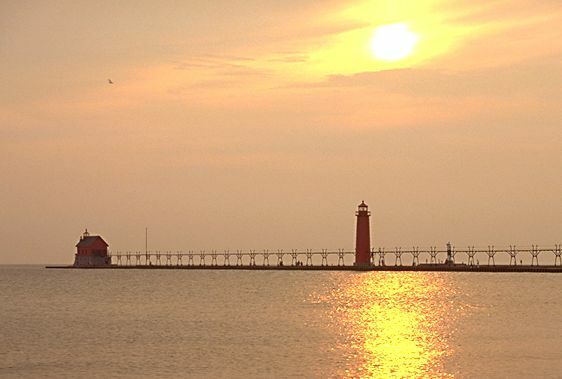 And, for the first time in memory, Coast Guard members plan to use a stretch of water at least five miles off this Michigan shore — and 33 other offshore spots near cities like Cleveland; Rochester; Milwaukee; Duluth, Minn.; and Gary, Ind. — as permanent, live fire shooting zones for training on their new 7.62 mm weapons, which can blast as many as 650 rounds a minute and send fire more than 4,000 yards. Many here in Grand Haven, a town whose history is so lovingly intertwined with the Coast Guard that it holds an annual festival celebrating the service branch, say they think of Coast Guard members mainly as the rugged sailors who race off to search for and save troubled boaters. But even here, in a town that calls itself “Coast Guard City U.S.A.,” some say the thought of members firing machine guns anywhere near these waters strikes them as dangerous to ordinary boaters, potentially damaging to the Great Lakes’ ecosystem and, frankly, a somewhat surprising place to be bracing for terrorists. Carole Loftis, the owner of Snug Harbor, a popular restaurant with windows on the water, said that although she certainly carried concerns, like most Americans, about terrorism, drunken boating seemed a more frequent threat around here. “This seems a little like overkill,” Ms. Loftis said of the shooting plans. The administration’s use of Rovian catchphrases is nothing but propaganda designed to stifle the loyal opposition. We Democrats are determined to restore our nation’s military strength, refocus on the real terrorist threat, bolster security safeguards at home and reestablish the credible standing we once had in the world. That is not defeatist. It is a call to formulate and execute a winning game plan for the War on Terror. PROFESSOR Stephen Hawking, Britain’s world-renowned physicist, is to switch from theories of multidimensional space to the three dimensions of the Imax cinema by starring in a film that sets out his ideas on the origins and fate of the universe. The film, Beyond the Horizon, will tackle some of the most daunting theories espoused by Hawking and other cosmologists, from the idea that space has up to 11 dimensions to the cause of the big bang itself. The project is certain to boost Hawking’s public status. He will take the starring role and narrate a soundtrack explaining cosmological concepts as they are brought to life by advanced computer graphics. His aim is to popularise science, but for many the appeal could also lie in the ability of an Imax 3D film to make Hawking and his wheelchair appear to come right out of the screen into the audience. Acting is not totally new to Hawking who previously made a guest apperance on Star Trek: The Next Generation (photos above). The Times of London reports that “Leonard Mlodinow, a physicist and former scriptwriter on Star Trek, is working with Hawking on the film project.” I wonder if this movie was developed as a consequence of Hawking appearing on Star Trek. He analyzed the religious practices and body mass index, often referred to as BMI, of more than 2,500 people during an eight-year period from 1986 to 1994. He found that the use of religious media resources, such as television, books or radio, was a strong predictor of obesity among women. The incidence of obesity increased by 14 percent for this group. At the same time, the more often women attended religious services, the less likely they were to be obese. (Hat tip to Dr. Johan Bushwell’s Chimpanzee Refuge).